FedEx (NYSE: FDX) announced mixed second quarter earnings for fiscal year 2017 on December 20th. The company’s revenue grew by 20% on a year-on-year (y-o-y) basis to $14.93 billion for the quarter. 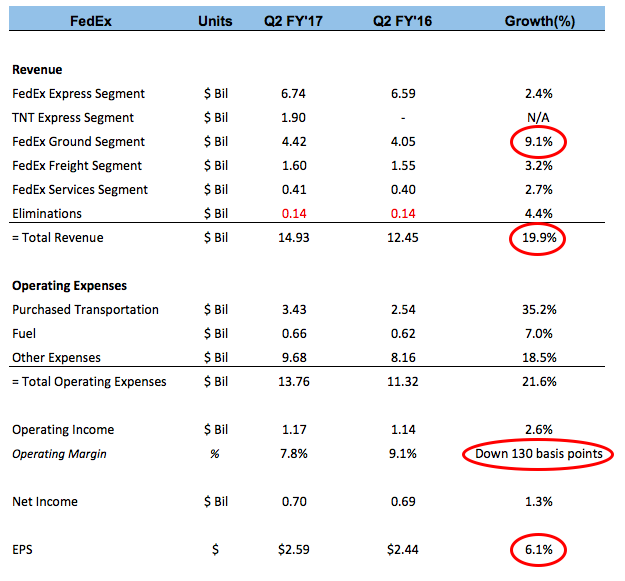 The revenue growth was driven by growth in the FedEx Ground Segment and the addition of TNT Express. The company’s operating profit rose a moderate 2.6% y-o-y to $1.17 billion for the quarter. Despite the increase in operating income, the company’s margins declined 130 basis points to 7.8% for the first quarter. FedEx’s net income increased marginally to $700 million or $2.59 per share for the quarter. On a non-GAAP basis, the company’s earnings per share were 9% higher than the prior year quarter at $2.80, against Reuters’ compiled consensus estimates of $2.90. 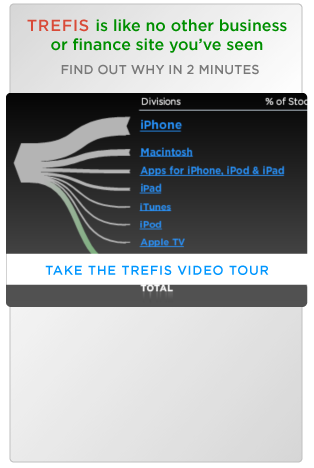 This resulted in the company’s stock dipping 3% in after market trading. Coming off a strong first quarter, FedEx continued to see revenue growth in this quarter. Its growth momentum was driven by a rise in volumes and revenue per package across all major segments. The growth was particularly visible in the FedEx Ground segment, which saw revenues increase by 9% over the same period last year to $4.42 billion, primarily due to a 5% increase in average daily package volume and a 4% increase in revenue per package. Revenues for FedEx Express increased a marginal 2.4% over the same period last year to $6.75 billion. Moreover, the addition of TNT Express helped the company increase its revenues by $1.9 billion. FedEx’s revenues continued to outpace its expenses, helping the company post operating profit of $1.17 billion, a moderate increase of 2.6% from the prior year quarter’s figures. Integration expenses related to the acquisition of TNT Express impacted the company’s operating margins, which declined 130 basis points over the same period last year to 7.8%. The company’s net income rose a modest 1.3% over the prior year quarter to $700 million or $2.59 per share. On an adjusted basis, EPS grew 8.5% over the same period last year to $2.80. FedEx has made significant investments to improve its facilities that bode well for the company in the long run. In the last quarter, the company’s capital spending was $1.46 billion, an increase of 8% over the prior year quarter. The company’s capital expenditures as a percentage of revenue was 9.8%, 1 percentage point lower than last year. Moreover, the company completed 185 facility projects, including four major distribution hubs, 19 fully automated stations and 69 relocations. For the full fiscal year, the company expects its capital expenditures to be in the range of $5.6 billion. With increased capital spending and the integration of TNT Express into its existing networks, the company is well placed to cater to the increasing demand from the e-commerce space going forward. FedEx had already announced hikes in rates for its offerings, which will come into effect from January 2, 2017. For the full fiscal year, the company expects to generate net income per share in range of $11.85 to $12.35, on a non-GAAP basis. On a GAAP basis, the company expects net income per share in range of $10.95 to $11.45.